Xiaomi the flagship killer Phone company is going to launch sequel of Mi Mix, bezel-less phone Mi Mix2. This futuristic phone is about to launch in India on 10th of October. Yeah Just Few Days Left. Mi Mix Comes up with 5.99" FullHD IPS LCD display with resolution of 2160 x 1080. But when we hold The phone it is just the display size we are holding cause the bezels are Super thin. Talking about the Hardware it comes with Qualcomm Snapdragon 835 Octa Core Processor, 6GB of RAM, and GPU Adreno 540 For Lag Free Gaming. 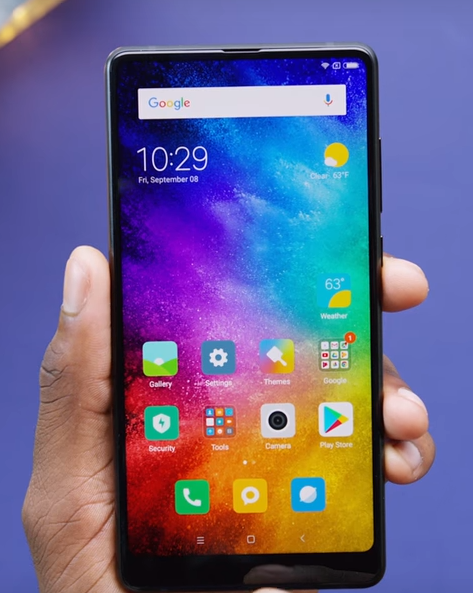 Phone.We can surely say this is a Camera Phone.Video Stabilization is Good.Front Facing Camera is 5 Megapixel and placed in Bottom Right Corner same Position as that of Mi Mix but the glass over it is Somewhat a Polarized Glass. Volume button are Placed on right side of the Phone just above the Power Button. Speakers are placed at the Bottom and a USB port. There is no Headphone Jack. A 3400mAh non-removable battery which on average use can last long 2 days. It runs on OS Android Naugat(7.1). Now about the Price,This handseet is Tagged at $570 of 64gb storage version. There is a Special edition of the Phone with 8gb of RAM,128GB of Storage and All Ceramic body but this Edition is limited.So we are not sure about whether it is Going to Launch in india or not.